My name is Yuri Beckers and I am 41 years old. I was born in Maastricht, a city in the southern part of the Netherlands. When I was about 7 or 8 years old, my parents took my sister and me to Normandy. I remember standing in the middle of all those white crosses at the US Cemetery at St. Laurent-sur-Mer, overlooking Omaha beach and the sea in front of it. When I turned to my dad, asking about all the white crosses, I heard that these were all men that fought for my freedom. This made a huge impression on me. Men were buried there. Ever since then I always have been fascinated by certain World War 2 events. 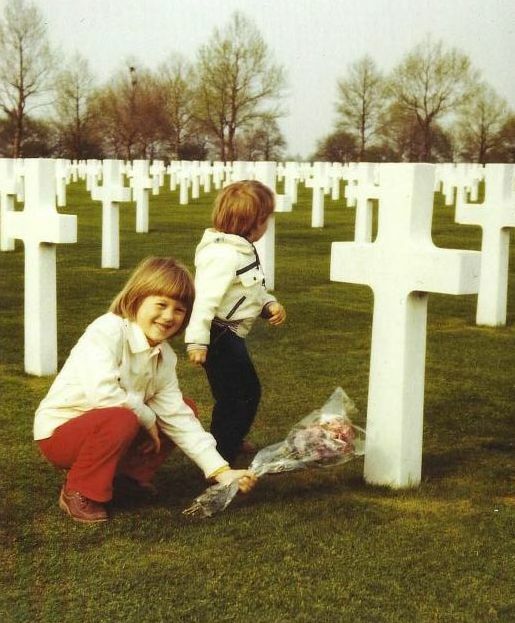 My sister and I paying respect to the fallen men at a very young age. As I grew older I started to read all the books I could find on D-Day, the battle for Normandy, the Battle of the Bulge and Operation Market Garden. I also watched hours and hours of documentaries about these battles. More and more I became interested in knowing more about the soldiers. My father was involved in organizing a “Liberty Relay”, where members of an athletics club would each run several miles while holding a torch, following the route of the 30th Infantry Division. They went through the many towns that this Division liberated, ending in our hometown of Maastricht on the day it was liberated. Through this, I met the first veterans. Their stories always impressed me. My parent’s house is also not far from the US Cemetery at Margraten and through the years I have often visited this special place, and still go there whenever I am nearby. Reading the names on the marble crosses made me want to find out more about the individual men. In 2000 I bought a book called “If you Survive”, written by 4th Infantry Division veteran George Wilson. This book informed me about the battle in the Huertgen Forest. I looked up where this terrible battle took place, and was amazed to learn it was only an hour by car from my hometown, just across the German border. I was surprised because in all the years of reading about World War 2 battles, I had never heard of this battle before. So, I then started to do research to this battle, and found out not many books had been written about it. I continued my research about the battle and wanted to find out as much as possible. I visited the form battle area many times, never failing to impress me. Mapping out positions and movements in the Huertgen Forest in May 2012. Field research in the Huertgen Forest area in 2013. It was through this research that I learned about the 9th Infantry Division’s actions in the Huertgen Forest. Reading about what they went through, I wanted to find out more, and started to focus on this Division primarily. The more reports I received from the National Archives, the more fascinated I became. The 9th Infantry Division’s actions in this battle are often overlooked in the books that are available about the battle. When I met a veteran of this Division, he shared some great stories, and supported me in the idea of writing a book about the events of his Division. This was the beginning of a long project. For several years now I have been studying the actions of the 9th Infantry Division, and writing the book about their involvement in the Huertgen campaign. Doing 9th Infantry Division related research. Although I don’t have an academic degree in history, my passion and dedication to learn more about the 9th Infantry Division’s history and its men has brought me far. Through the years I have been in touch with about 50 veterans, and hundreds of families. All of them have been very supportive of my research and projects, and some cherished friendships came out of this. Writing a book about the involvement of the 9th Infantry Division in the Huertgen Forest Battle. Missing in Action Project – Find out more about the MIA men, create Tribute Pages for these men, locate families, and help providing information that might help identifying remains. Historical advisor for authors, historians, professors, teachers and TV Networks. Co-Editor / Historical adviser of a 9th Infantry Division Field Artillery soldier’s diary which has published in 2017. Providing information about men who served in the 9th Infantry Division. So far I have shared information with nearly 500 families and have learned a lot in return. Record and preserve stories and information of veterans. So far I have done this for 50 veterans. Creating the largest online database in regards to 9th Infantry Division men. Building up the largest collection of historical documents, archival material, footage and pictures. Working on a 9th Infantry Division Exhibition. I am always learning more and new things about this Division myself and I hope this website will provide some good information for you as well. Feel free to contact me. While going through this website, please think about all those men who fought for our freedom. They were young, a whole life ahead of them. They had dreams, they had families. They had loved ones. They left all of this behind to fight on foreign soil and liberate us from the Nazi tyranny. The men met each other in training, on a ship or maybe on the battlefields. They are bounded by their shared experiences of war and helped each other through some of the worst times in their young lives. When one of them died, it affected many other people’s lives. Some of the young men never came back home. Others did come home, but never left the war. They carried their days with the 9th Division with them for the rest of their lives. It shaped the way these men lived their lives after the war. I don’t think we will have another generation as great as the one that served in World War 2. I hope they were able to make their dreams come true after all. That they married that girl they loved, started that job they wanted, and found a way to live their lives again. When you pass any of the US Cemeteries, please stop for a few minutes and look at the names of the men who never got to live their lives and make their dreams come true. They died, so we could live our dreams and live in freedom and peace. Visiting my adopted grave of 2nd LT. Guy Remington, Sept. 2013. Visiting my adopted grave of 2nd LT. Guy Remington, Sept. 2016. I will forever remember their sacrifice and will make sure to preserve their history for future generations. Thank you for visiting my website and reading my story here.